Area of expertise: - Political Communication, Terrorism & Global Conflicts, Media Theories, International Communication, Journalistic Translation, Public Opinion, Media & Society, Radio & Television Production, Television Documentaries, Visual Communication & Advertisement. Qualifications: - Ph.D., Media Studies, Bournemouth University, United Kingdom, 2013; MLitt., Media Culture, University of Strathclyde, United Kingdom, 2008; PgD., Information & Library Studies, University of Strathclyde, 1992; BA, English Language & Literature, 1988. Experience: - Assistant Professor, Department of Mass Communication, Tourism & Fine Arts, Oct. 1997- present. Memberships: - The Centre for Public Communication Research (CPCR), Bournemouth University, United Kingdom. - The European Communication Research and Education Association – ECREA, United Kingdom. - Arab Electronic Media Union, Egypt. Member of Culture & Arts Association, Saudi Arabia. - Poetas Del Mundo, Chile. Head of Advisory Board, Women Writers, Saudi Arabia. Latest Activities: - Academic paper presenter and Evaluation Panel member at 3rd World Conference on Media and Mass Communication" between 20-22 April 2017, Kuala Lumpur, Malaysia. Academic paper presenter at the Eighth International Conference on the Image, Venice International University between 31 Oct. - 1 Nov. 2017. Panel member of the 4th Political Rhetoric Writing Competition 2018, Kingdom of Bahrain. Khuldiya Al Khalifa updated their profile information. 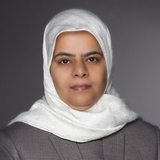 Khuldiya Al Khalifa changed their profile image.